If you wanted to know just how bad one can misspell "God", this would be your answer. This spelling lacks the letter He, has a randomly added Ayin in the middle, and the Mem isn't in its final form. Also, completely unrelated Nikkud under the Alef. It looks as if this guy knew how the word was supposed to sound in Hebrew, and tried to transliterate it on his own. Never a good idea! In this case even an automatic translator can do better. I bet God is none too happy about this ridiculous treatment of his name. I sure am pissed when people misspell my name! Today's tattoo was sent to us by Dariusz from Poland, who spotted this prime example of bad Hebrew tattoo on the Polish pop singer Doda Elektroda. As you can see, Doda and her husband Radek got matching Hebrew tattoos. Radek's tattoo correctly says "Dorota", which is Doda's real name. The tattoo on Doda's arm, however, was supposed to say "I love Radek". Instead, it says "To love a Radek". Grammar fail! As often happens, tattoos last longer than love, and this couple was soon divorced. Doda regretted her Hebrew folly but didn't learn a lesson regarding foreign tattoos. 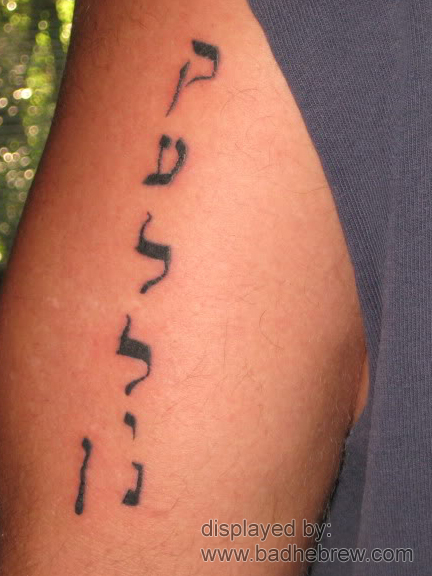 She promptly covered the Hebrew tattoo with another one, this time in Sanskrit. I wonder if her Sanskrit tattoo is correct? First, an announcement. 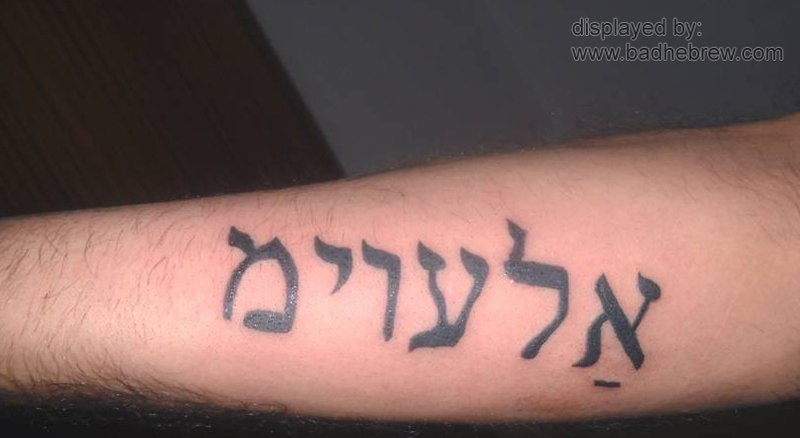 You can now comfortably browse Bad Hebrew Tattoos on your iPhone, using our brand new iPhone App, available for free! To tell you the truth, had this tattoo not been labeled on the site I plucked it from, I would have never been able to interpret it correctly! It reads like a misspelled Ka'alelinen, not at all what the poet intended. There are several glaring mistakes in this bad Hebrew tattoo. First, the doubling of the letter Lamed - in Hebrew you don't do that, even if Collin does have double L. If it sounds like one L, you write just one Lamed, otherwise a vowel between the two Ls is assumed. Same goes for all double-letter names, such as Anna, Todd or Bobby. Then, there is the last letter, Nun. The victim unwittingly wrote both final and not-final forms of the letter, instead of using just one. This is a very common (and ugly) mistake, for which alphabet guides and their unaware users are to be blamed. And finally, the O in Collin is much better represented by a Vav and not the Ayin our victim chose. Correcting all that, we get a correctly spelled Collin in Hebrew. Note that this spelling can be used for all similarly pronounced names, like Colin or Coline.